If you think you have mould in your home or business, it is important to contact a professional with the appropriate tools, certification, and experience. Whether on the radio, on the television or at the dinner table, mould has become one of the hottest topics of discussion. Why? Mould is not new to Canada or the world, but we have in recent years learned more about mould’s benefits and its adverse effect on our health. To truly understand mould removal, you need to understand what mould is, how to assess the situation and how to safely remove mould from a home or business. Mould is a filamentous fungus commonly found both indoors and outdoors. To grow, mould requires moisture, the appropriate environment and an organic food source. To continue the life cycle, mould releases into the air tiny seeds called spores, which attach to a surface with the required environmental conditions to continue the life cycle. These spores can easily enter our homes and businesses through open windows, open doors, on our clothing or on pet fur. If you think you have mould in your home or business, it is important to contact a professional with the appropriate tools, certification and experience to assess the damage and find the cause of the mould growth. Pro Pacific DKI is certified in Mould Remediation through the Institute of Inspection, Cleaning and Restoration Certification (IICRC). We use the most up-to-date technology, including infrared camera and borescope. Once the cause of the mould is has been determined, the remediation begins. With Disaster Kleenup® International Contents Solutions and the latest technology, including dry ice blasting, Pro Pacific DKI will successfully remediate your home or business. 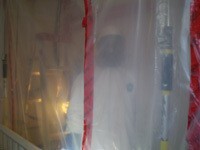 At Pro Pacific DKI, we have fully trained and qualified staff to remediate any mould issue, large or small. From the latest in investigation tools to the most up-to-date remediation tools and environmentally responsible products, Pro Pacific DKI can assess, contain and remediate any mould issue. Contact us 24/7 to arrange a visit to your home or business.